In his second book, Bill Baker again skillfully cuts through the theory, advertising-speak and branding jargon to simplify and clarify the practice of branding small cities for improved tourism, economic development, placemaking and urban design. This must-read primer demystifies branding, shows how to uncover your most potent brand platform, and provides real world examples, as well as affordable, proven tools, templates and checklists to help breathe life into small city branding and marketing. Baker s writing style has been describes as engagingly direct and to the point, and his books are recommended as essential reading for anyone involved in the study or implementation of city and destination branding, marketing and planning. 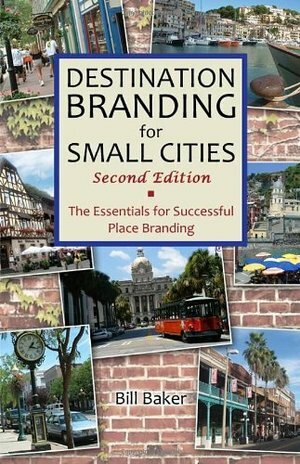 This revised edition has retained and updated its focus on the essentials for successful destination and place branding. Among the additions are: - The essentials for successful brand planning for small cities including new and updated processes, advice, checklists and techniques. - Explanations of the different forms of place branding, branding in tough times, selection of place branding expertise and the role of product development, placemaking and wayfinding in place branding. - How to introduce a strategic focus to enhance small city competitiveness. - Interesting insights from some of the world s leading place branding consultants, academics and practitioners. - Worldwide examples from the USA, Asia, Europe, Middle East and Australia. While the title is Destination Branding for Small Cities, the underlying principles and processes can just as readily be applied to regions, counties, Downtowns, Main Streets, resorts, and even states and countries.